A strong earthquake has struck New Zealand's South Island with reports of "violent shaking" in buildings. 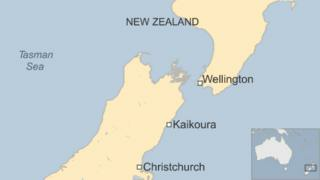 The quake hit at 15:36 pm (03:36 GMT) with its epicentre about 66km (41 miles) from the town of Kaikoura. The US Geological Survey said it was a 5.9 magnitude quake. New Zealand's GeoNet said it was 6.2 magnitude at a depth of 52km. Residents as far off as Christchurch and Wellington felt the quake but no serious damage is expected. A store owner in St Arnaud told New Zealand's Stuff news agency that the shock was "very very frightening". "It started shaking and we just waited. It became very violent so we ran outside," said Sandy Pearce, adding that much of the stock fell off the shelves. Telecommunications provider Spark reported that its mobile network was facing congestion issues after the quake in parts of New Zealand. Friday's quake hit in the same area as a 4.7 magnitude tremor on Thursday, and was followed by several aftershocks. It was the same magnitude as the 2011 quake that destroyed much of Christchurch's downtown, but it was much deeper meaning any damage will be less severe. New Zealand straddles two tectonic plates, and lies on the Ring of Fire, the line of constant seismic activity that circles the Pacific Rim.